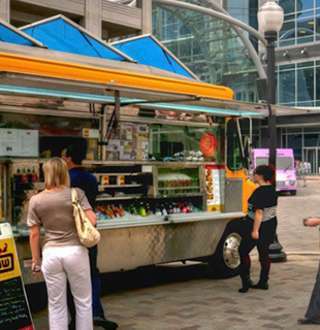 If you&apos;re at an outdoor concert, a festival, summertime Food Truck Thursdays at the Gallivan Center, or a bar with a patio, you&apos;re likely to see some of Salt Lake&apos;s tasty food trucks on the scene. These mobile eateries supply everything from Asian fusion to BBQ to cupcakes. Track one down, you won&apos;t be disappointed. Similar to its counterpart big cities, Salt Lake&apos;s food-truck scene is revving up big time. From Asian fusion to burgers, from cupcakes to coffee, these mobile food purveyors are redefining and revolutionizing on-the-go eats. Salt Lake&apos;s Granary Row, a pop-up market and festival space located in the Granary District, hosts food trucks every Thursday, Friday, and Saturday night in the summer and fall from 6 - 11 p.m. A number of Salt Lake&apos;s food trucks set up shop to offer dinner and entertainment.